Britain could be out of the EU by 22 May if the Commons backs a customs union in Monday night’s indicatives votes, according to officials close to the Brexit negotiations in Brussels. With Downing Street’s agreement, a reference to the intention to negotiate an ambitious customs deal would be swiftly written into the political declaration and formally signed off at the EU leaders’ summit on 10 April. Brussels would then expect all the necessary withdrawal legislation to be passed by parliament by the end of May to avoid the holding of European elections in Britain. The prime minister’s deal, in which the political declaration does not tie both sides to negotiating a customs union, has been voted down three times – by 230, 149 and 58 votes. The writing into the deal of a customs union, an idea tabled by the former Conservative chancellor Ken Clarke, lost by only eight votes when it was voted upon last Monday alongside seven other ways forward, with both the SNP and the Liberal Democrats abstaining. “The eight proposals that were rejected earlier will now be limited and combined with each other and this can be voted on Monday and possibly Wednesday,” Guy Verhofstadt, the European parliament’s Brexit coordinator, told the Belgian radio station VRT. “There was almost a majority in favour of a customs union with the EU. What we expect is that a proposal could reach a majority around the customs union and then we are prepared, on the EU side, to renegotiate the declaration and to include that customs union therein,” he added. 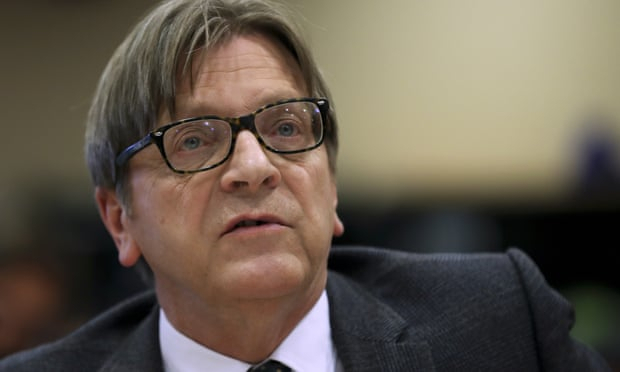 Verhofstadt went on to describe the prospect of a lengthy extension of article 50, and the need for British MEPs, as “disastrous” but still avoidable. He said: “If that political statement is adjusted, I think a majority can be found in the British House of Commons, because you will get cross-border cooperation between Labor and the Conservatives. “That new political statement can then be approved at a European summit on 10 April and then we will give the British the opportunity to formalise it in English legislation by 22 May”. Verhofstadt’s optimism is not matched in all the EU’s capitals given the British prime minister’s previous rejection of a customs union. In a speech on Saturday, Germany’s EU minister, Michael Roth, told an audience in Berlin: “Brexit is a big shitshow, I say that now very undiplomatically”, adding that “90 percent” of the British cabinet had “no idea how workers think, live, work and behave”. He added that it would not be MPs “born with silver spoons in their mouths, who went to private schools and elite universities” who would suffer the consequences of the mess. “I don’t know if William Shakespeare could have come up with such a tragedy but who will foot the bill?” Roth said. The cabinet is divided over whether the government should follow parliament’s lead if a majority is found for a customs union. Over the weekend, the justice secretary, David Gauke, said the prime minister would have to “look very closely” if MPs backed a customs union in a fresh round of indicative votes. But on Monday, the chief secretary to the Treasury, Liz Truss, who is widely believed to be planning a leadership bid, expressed her opposition to the proposal, falsely claiming that the prime minister’s deal had lost less heavily when put to the Commons. Labour is backing the idea of a customs union but its policy is to demand a say in the EU’s trade policy. Brussels would likely seek to avoid a row on this issue ahead of the withdrawal agreement and political declaration finally being ratified by the Commons. But one EU official close to the negotiations admitted the UK would face stiff opposition to anything more than a symbolic consultative role. Over the weekend, Labour’s deputy leader, Tom Watson, suggested that any Brexit deal should be put to a confirmatory public vote to “bring the country back together”.